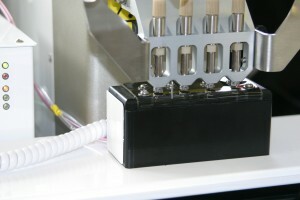 The instrument can be configured to use small or large bottles (as shown) and also smaller vessels that attach to the Preddators dispensing head to reduce dead volume. Wagner Medizin- und Pharmatechnik is a fully trained and authorized service and sales provider for the Preddator from Redd & Whyte throughout Europe. Wagner Medizin- und Pharmatechnik`s exceptional service history makes the company a valued partner for integration companies as well as end users looking for exceptional ultralow volume dispensing. For sales and service in the US please contact our company Wagner Life Science. The Preddator is a low-volume, non-contact, bulk reagent dispenser that was designed and developed in close collaboration with research scientists from two major pharmaceutical companies. 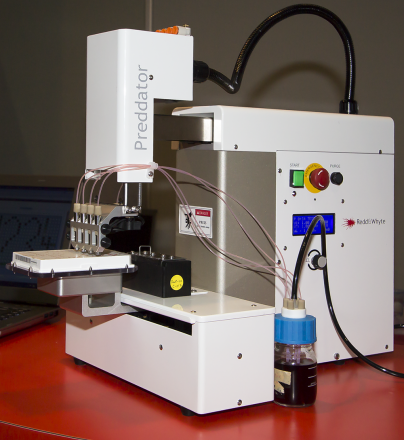 Preddator – The art of precision reagent dispensing. 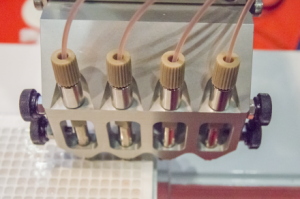 From viscous reagent handling and cell dispensing to HTS. The video above shows the precision in which the Preddator can perform low volume dispensing. The video shows the Preddator spotting out nine aliquots within each well of a 384 well plate and was done to highlight the incredible precision attainable by the system.